Meet Edwin one of our lovely teachers! 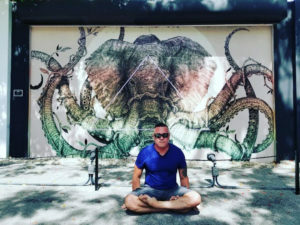 Learn about his personal journey with yoga and how he encourages students to have their own transformative experience. Feel feel to attend one of his classes and read on to learn more about Edwin. I found yoga through self-inquiry as part of a medical condition. I was hooked after my first class (Hatha Yoga with Yoga Nidra). Sharing yoga with others is something I am passionate about. It fills my life with joy and gratitude. My personal journey after practicing yoga is the reason I teach. I am now more grounded and have a different outlook on life as a whole. Yoga has helped me nurture my own individuality. As a teacher, I acknowledge and celebrate each student’s uniqueness and promote self-care. I encourage students to listen to the body, the breath, and the heart. I always say that we are only given one body in this lifetime. As such, we must treat our bodies like temples. I like to challenge students with poses they are uncomfortable with or poses they feel they don’t have what it takes to master. A challenging pose for students is classic headstand. 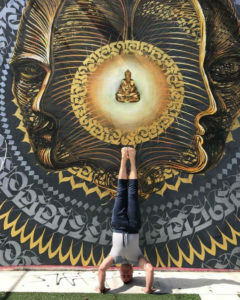 Classic headstand (Salamba Sirsasana) relieves stress and anxiety, but it also makes people feel empowered once they get over the fear of being upside down. I had a moment of exhilaration when I was first able to hold a classic headstand in a room packed with fellow students. I would love to see other students in my classes have the same experience. My favorite style of class to teach is Meditative Yoga Flow. It allows the student and the teacher to integrate breath work with yoga asanas, which in turn ignites the energy that flows through the inner self. 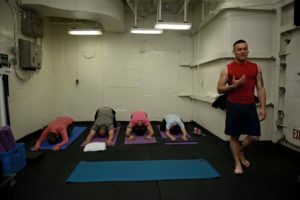 This style of class also brings us back to the basic tenets of the yoga practice: one universe comprised of many souls connected as one with one common purpose. experience. I learned that in the process, I was judging myself. I immediately realized I needed to accept my own shortcomings and went back to my original sequence. Practice from the heart and always remember to pay it forward. The way yoga comes to each of us is unique and it has different meanings. Yet, at the heart of every practice, there is a quest for unknown answers that resides within each individual. A yoga practice is not static. There are peaks and valleys. To stay motivated and to continue growing in the practice, one needs to acknowledge and accept this fact. You must try the practice at least once. When you do, remain open to the experience. Don’t place any labels and hold no judgement. The experience will show itself in ways you could never imagine. My favorite thing is the closeness of the yoga community because there is no sense of competition. I believe that everyone in this world can benefit from yoga practice at any levels. Given that DC is so diverse, I don’t think that any particular group can benefit more than others. Every single person in this city can benefit from the practice. However, each person’s experience will be unique to their own journey. Edwin practices yoga in his home. 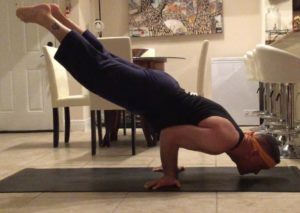 Peacock (Mayurasana) pose took me years to master. Just like it took me years to work on the parts of my inner self that make me the person that I am today.